Driving through Llandovery this morning I was struck by a sharp contrast. Just past the supermarket was a huddle of cold postmen and women, picketing outside the sorting office, trying to preserve their jobs, get few more quid, have better working conditions and whatever else. I expect they would rather be inside working, or off in their vans fending off sheepdogs and wading through mud. A few hundred yards further on I met a queue of traffic at the level crossing. Normally the wait is about 30 seconds as the single carriage train passes through. This time the wait was longer. Then I realised it was the 'Royal Train', eight or more carriages long (I couldn't tell exactly as it seemed to stretch the entire length of Llandovery). How bizarre, why on earth is this enormous train needed to transport one man, Prince Charles? The massed police presence, complete with helicopter, enures a continuing royal carbon footprint roughly the size of Wales. It rather cancels out the noble efforts of the 'organic' mattress factory he went to visit. 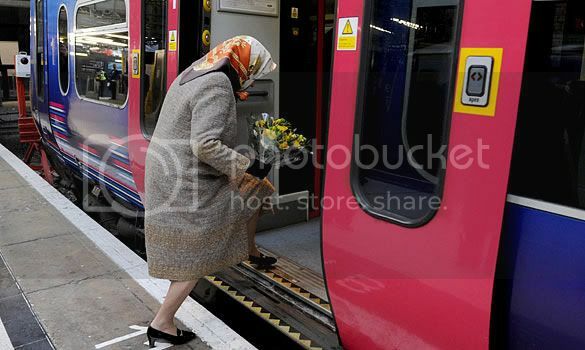 It is a relatively little known fact that when the Queen travels to Norfolk for her Christmas break, she travels by scheduled train. ... it is a regular service used by regular passengers. No helicopters for her, or chartered flights. 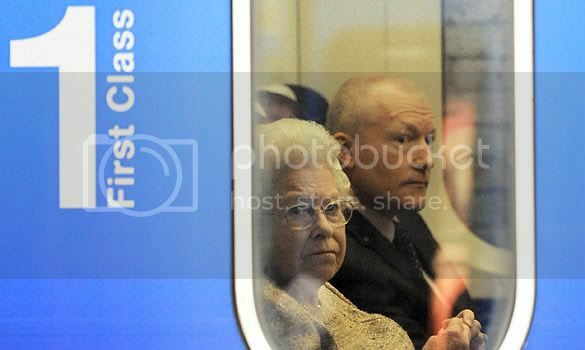 Although this has been her chosen mode of Christmas travel for a few years now, this was the first year that Buckingham Palace has allowed the press to take a photographic record of the event. I have to admit that the woman has gone up in my estimation. I certainly don't believe in a monarchy, but if that's what people want it is certainly better to have a monarch who behaves in this way than a successor who behaves in the way he does. Whatever the opinions of the current Head of State are, she manages to do a fairly good job of keeping them to herself. That at least makes the unfairness of a hereditary Head of State bearable. Her son, in complete contrast, can't help but make his opinions known on any subject that enters his head ... and, much worse, seeks to use a position that he hasn't earned and has done nothing to deserve to influence political decisions. He's done it repeatedly in the past, and he's still doing it now. There is no place for that in a democracy. So I wish his mother a long and happy life ... at least into the early 2020s, by which time I fully expect we will have decided to be an independent nation. When we've done that, we'll be in a position to decide what sort of Head of State we want. The Black Prince had a certain ring to it, and the Black Adder was at least funny ... but the Black Spider! Do we have so little self-respect? Of course, the difference is that there isn't a first class compartment on the Heart of Wales Line. Who's that bloke she's with? Does Philip know? You say she does a good job of keeping her views to herself, but that has not always been so. She was quite vocal about her opposition to Welsh and Scottish Nationalism in the late 60s and 70s, which, in my view blew the myth of her political neutrality wide apart. I prefer her spawn's excessive and conspicuous consumption - an as articulate argument for the republican cause as any I could muster in the same time! I've got quite a bit of time for old Charlie PoW, actually. I think he's much maligned by the tabloid press, and pilloried for having unfashionable things like principles. In fairness to him, if he seriously believes in the issues that he is trying to influence, then why not have a go? I as a member of the electorate try to influence my MP or AS by way of letters and emails, why not Mr Windsor? "I as a member of the electorate try to influence my MP or AS by way of letters and emails, why not Mr Windsor?" Perhaps because he doesn't have a vote? I think the Queen has done an excellent job representing the English, but not so much the Welsh. Like Iestyn, I also think that Charles, the Duke of Cornwall, has gotten a bad rap by the tabloid press, and I like his principles and his interests. However, I believe that the Windsor's are for England, and Wales needs it own resident Welsh royal family. Alwyn, I think it's Steve Davies. Apparently she's an avid snooker fan. Siônnyn, I would very much appreciate a link to this vocalized opposition to Welsh and Scottish nationalism. I wasn't aware of any ... but it was a long time before I got interested in politics. Anyway, what would it matter to her? She would still be Queen of the Scots even after Scottish independence, just as she remains Queen of a good number of other countries that have become independent. Iestyn, as Anon said, there's nothing wrong with anyone expressing opinions or trying to influence politics, but it is incompatible with being a symbolic Head of State. If we want a political HoS, we should choose who that HoS is. As this story shows, the Black Spider wants to have it both ways at the same time. He wants the influence, and he seems especially anxious to be seen as having influence, but he refuses to hold himself accountable for the influence he wields. That's nothing more than cheap hypocrisy. DLl, I think you must be quite mad to want to replace one unelected, hereditary HoS with another. But I do think that Wales should do something to replace the English idea of a Prince of Wales rather than just let the Windsor family carry on using the title. I believe we should have a non-political HoS (rather like Ireland) and that we should elect him or her for a long period (say 8 years, so as not to clash with the electoral cycle). There is, of course, no reason why a descendant of the Windsors shouldn't stand for election ... providing they live in Wales, of course. If they are as popular as they claim to be, they'll be a shoo in, won't they? I think we should give our elected HoS the title Tywysog(es) Cymru / Prince(ss) of Wales to make sure that the title doesn't continue to be used by someone who doesn't deserve it. The Welsh word means "leader" and doesn't need to denote any form of heredity. Prince too has the same root as "principal" or chief, rather than necessarily meaning the offspring of a king. If the Irish word Taoiseach can be readily accepted as "leader" in a political sense, then the very similar Tywysog should be just as acceptable to us, and to the rest of the world, as the title of our leader in a civic and ceremonial sense. Or course, this in itself has nothing to do with independence. We must first decide to be independent with the current HoS (just as will be the case in Scotland) and only later decide if we want to change that arrangement. It may take decades, or not change at all, as has been the case with other countries. "I think we should give our elected HoS the title Tywysog(es) Cymru / Prince(ss) of Wales to make sure that the title doesn't continue to be used by someone who doesn't deserve it." You know, I actually toyed with this idea too, and kinda like it. However, after much thought and consideration, I am too attracted to the romantic notion of restoring the title Prince(ess) of Wales to a family member directly decended from the likes of Rhodri the Great, Gruffydd ap Cynan, Owain ap Gruffydd Gwynedd, and others. But I so very much agree with many of your other suggestions with regards to an independent Wales! Just let the people keep this one romantic notion!